Are the Bears Right About Gap Stock? As the apparel company enters the holiday season, investors have a lot to consider. Shares of Gap (NYSE:GPS) briefly fell to a 52-week low after JPMorgan analyst Matthew Boss downgraded the stock from "neutral" to "underweight," then cut his price target from $30 to $24. Boss claimed that Gap is poorly prepared for the holiday season and that its decelerating comps growth, operational issues, and an imbalanced inventory (more bottoms than tops) will throttle its earnings growth. Boss noted that Gap's "direct sourcing exposure to China stands at 22%," which exposes it to rising tariffs. He also warned that although Gap raised its minimum wage to $10 per hour in 2015, it could face renewed pressure to raise its wages. Boss expects those headwinds to cause Gap's earnings per share to fall 7% to $2.38 in fiscal 2019 (which starts next February), compared to the consensus forecast for 5% growth. That outlook sounds gloomy, but value-seeking investors are probably wondering if the stock is oversold. At $26, the stock trades at just 10 times this year's earnings estimate, and it still pays a hefty forward dividend yield of 3.7%. Should investors ignore the bears and look at Gap as an undervalued income play? Is Gap's growth slowing down? Gap's comps growth has been a mixed bag. Its mid-tier namesake brand remains weak due to the growth of fast fashion rivals like H&M and Inditex's Zara, as well as competition from mall-based rivals like American Eagle Outfitters (NYSE:AEO). Nonetheless, the company's budget Old Navy brand remains popular with shoppers, while its higher-end Banana Republic business won back some shoppers with better-curated collections. Here's how those three brands fared over the past year. Source: Gap quarterly reports. *Excludes impact of a fire at its Fishkill distribution center. During the second quarter conference call, Gap CFO Teri List-Stoll admitted that the company wasn't "pleased" with its namesake brand's performance, but it reflected a "conscious choice to prioritize margin dollars over comp growth." In other words, Gap is cutting down on promotions to avoid sliding down the slippery slope of using markdowns to drive sales growth -- but this strategy also leaves it more vulnerable to cheaper fast fashion challengers. On the bright side, Old Navy saw growth in nearly every category, with denim, kid/baby, and activewear leading the charge. Banana Republic also fared well, as improvements to its product lineup and customer experiences boosted the brand's merchandise margin and the average dollar amount spent per item. What about the margin pressures? Gap expects flat to slightly positive comps growth for the full year, and for its earnings to rise 20% to 27%. That forecast sounds solid, but the company's contracting margins could cause it to miss expectations. Based on the new ASC 606 accounting standard Gap adopted this year (which impacts the classification of its costs of goods sold, occupancy expenses, credit card programs, and loyalty program discounts), Gap's gross margin fell 10 basis points annually to 38.8% last quarter. Gap attributed that drop to the weakness of its namesake brand. On the same basis, Gap's operating margin fell 10 basis points annually to 10.1%. 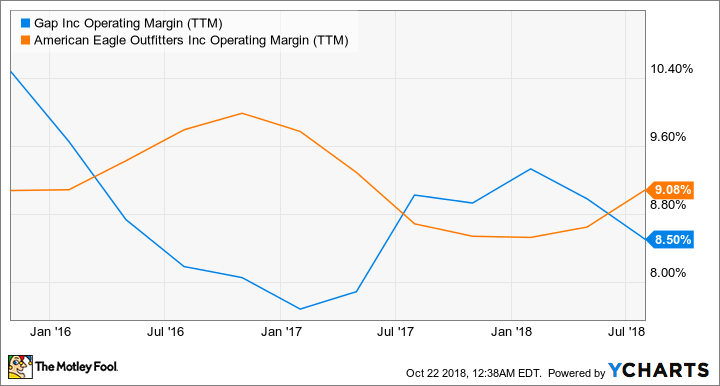 If we compare Gap's trailing 12-month operating margins to American Eagle Outfitters', we'll notice that the two retailers are headed in opposite directions going into the crucial holiday season. AEO also generated much better comps growth across its two core brands (American Eagle and Aerie) than Gap over the past year. AEO comps growth by brand. Source: AEO quarterly reports. This comparison suggests that the problems with Gap's namesake brand -- which competes against American Eagle and other mid-tier brands -- won't be fixed anytime soon. Gap is diversifying beyond its three core brands with its high-growth athleisure spin-off Athleta, as well as a new men's athleisure brand called Hill City, but they simply don't generate enough revenue to solve Gap's problems yet. Gap's downside is probably limited at these prices, but its stock won't rebound unless its namesake brand shows some signs of life. Meanwhile, the ongoing issues at Gap will leave the company vulnerable to tougher competition, tariffs, demands for higher wages, and even private label apparel from Amazon and Walmart. Therefore, I'd rather stick with a healthier apparel retailer like AEO instead of taking my chances with a struggling one like Gap.